The weekend is finally here, I am so excited!!! Going to watch Barfi! Yipeee!!! (though I guess I have told you earlier as well). Anyways, coming to the product under review today, it is an under eye gel, which you know by now is a must have with me even though I don't have dark circles :). 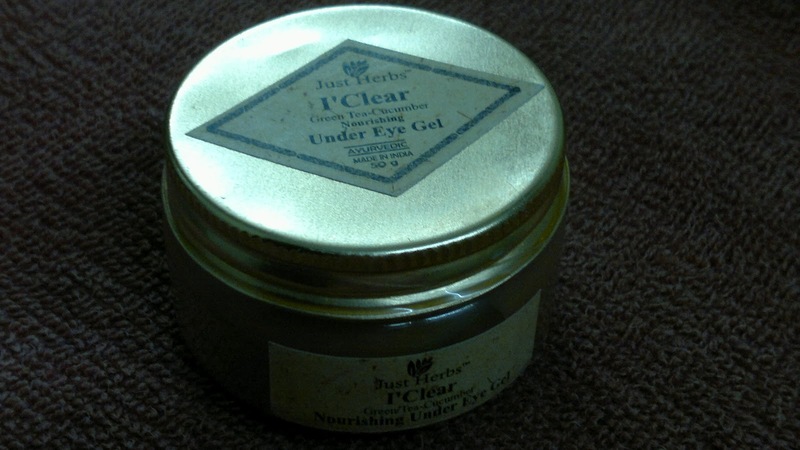 So, this under eye gel has a very nice name, which I like so much, it's called Just Herbs I'Clear Green Tea-Cucumber Nourishing Under Eye Gel. Price: INR 495 for 50 gm of the product ( I got this for INR 460). Packagaing was not so impressive, even at this price. I was expecting a bit more when you are paying close to 500 bucks for 50 gm of the product. The tub is made of clear plastic, which is very light weight and the screwable lid is made of some lightweight aluminium. It feels very cheap to hold this eye cream in your hand. I think they should perk up their product packaging big time, if all the products are packaged like this. In spite of the sad packaging , the product is really pretty good. 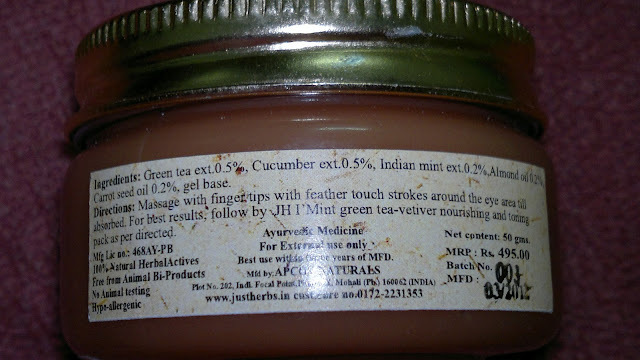 The gel is flesh colored and smells faintly of cucumber. 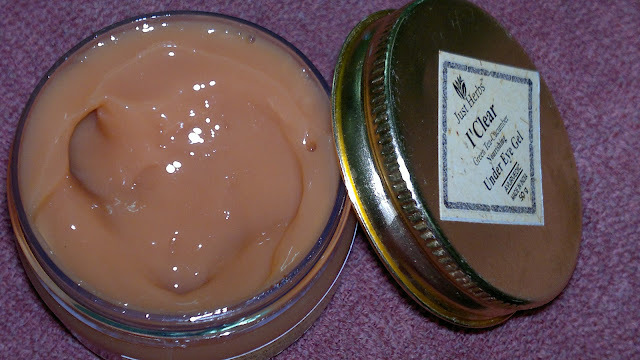 I like it 'cause it is actually gel like spreads easily on the skin. The gel feels cool against the skin after application. It takes a maximum of thirty seconds to get absorbed in the skin and leaves your eye area feeling nicely cooled and supple. With regular usage I have noticed lesser fine-lines and firmer under eye skin. Also, the eye area has brightened up and feels really smooth than before. A little goes a long way with this eye gel. The amount of product shown in the swatch pic above would be enough for both eyes as it spreads really easily and evenly. Product rating: A-, available via online beauty shopping sites primarily. Would recommend this to all girls looking for a nice eye gel, though a bit expensive, would sure come in handy and take care of your under-eye area. Personally would love to buy this again, I just wish the packaging is improved a little bit more and should not look as cheap as it looks now. It is also an effective antiseptic that soothes the skin while eliminating the bacteria.